The arrachera is a beef cut that comes from the diaphragm of the cow . This meat is thick, a little bit harder than other cuts, of strong flavor and very juicy. Although with a proper preparation, the arrachera can result delicate and tender. ...and in order to obtain this result we are going to reveal you the secret, which consists of marinating the beef in a proper way . It is funny but at the moment of marinating the beef, each person uses their own “secret marinating recipe". Here we will give you the recipe that we consider that gives the best Mexican flavor to the arrachera. You cannot serve this beef alone on a plate, you have to put garnishes so the dish looks spectacular. You can use one of these garnishes or the combination of many like: grilled spring onions, roasted nopal, mixed salad , quesadillas , guacamole , refried beans , Mexican rice , fought chilies , etc. – The arrachera is an ideal beef to prepare with friends on a grill at your backyard or in a picnic day. Making this recipe is very easy as you only have to marinate and fry the beef. In this recipe the arrachera is fried in a frying pan but you can also fry it on a grill, just make sure to smear a little oil on the grill. In the ingredients you will see many acid ingredients which are necessary to tenderize the beef. To prepare the arrachera first it is marinated for about 2 hours and then it is fried for about 5 minutes. Clean 1.1 lbs of flank steak and cut it into fillets; upon completion put the fillets in a food container and reserve. The juice of 2 Oranges. Pour the mixture that was beaten in the bowl over the flank steak fillets that were cut. Cover the food container where the flank steak fillets are and put it in the fridge. Leave the arrachera marinating in the fridge for 2 hours, so the flavors mix. The arrachera is marinated covered so the fridge temperature won’t dry it. Take from the fridge the arrachera that was left marinating and reserve. Heat in a frying pan over high heat 1 tablespoon of vegetable oil. Put in the frying pan the arrachera fillets that fit in and fry them for about 3 minutes per each side, until they are well cooked or to the level of doneness that you like the most; then serve them. Repeat the same procedure with the arrachera fillets that were not fried, it will be necessary to add in the frying pan more vegetable oil. * When you eat arrachera, it is always good to have warm tortillas handy. 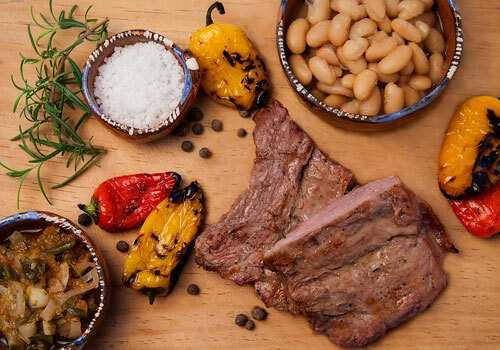 Tip: Put more flavor to the arrachera accompanying it with a salsa. Did you like the Arrachera? If you want to have lots of fun while cooking the arrachera, use the “Weber Grill". It has a good cooking space, it heats the food very well and it is easy to clean – it is a magnificent grill. If you want to use the best oregano for the arrachera, there is no other option than the “Simply Organic Oregano". It is a fresh and organic oregano full of aroma and flavor. If you need a good glass food container to marinate the arrachera, buy the “Kinetic Set of Containers". Besides having very good quality, the lids contain silver micro particles to preserve the food fresh and bacteria free for a longer time.